Bethlehem is Lehigh Valley’s oldest city. It was named on Christmas Eve, 1741, by a group of Moravians who relocated from North Carolina and settled at the confluence of the Lehigh River and Monocacy Creek. 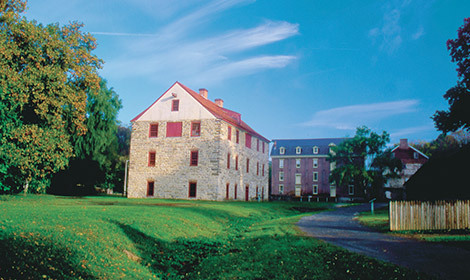 While the Moravians constructed some water-powered mills on the Monocacy, it was the canal, railroads, and resulting economic opportunities that lured large-scale industry to the south bank of the Lehigh River. The largest industrial force, Bethlehem Iron Co., soon dominated the town’s economy and way of life. Workers milled and forged steel made from local iron, coal, and limestone, helping to launch the Industrial Revolution in the late 1800s. Bethlehem has six distinct National Historic Districts within its boundaries, as well as two National Historic landmarks. Many of its original structures built by early settlers still line the streets of the downtown historic district. Today, Bethlehem’s art community flourishes, which attracts art lovers of all kinds. Musikfest offers a week-long event that draws thousands to experience live performances. Celtic Classic recognizes the presence of Bethlehem’s Celtic culture, while Christkindlmarkt brings visitors and residents a taste of Germany. Main Street in Bethlehem is an art form in itself. The care and maintenance of its historic past has been preserved to a pristine, inviting, and invigorating destination.